Lets just say this passenger didn’t leave the nicest comment to the pilot. The reason? The passenger didn’t like the fact that the pilot was a female. “To Capt. 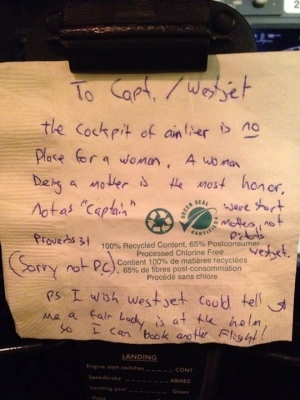 / WestJet,” the note, written on the back of a napkin reads, “The cockpit of airlier [sic] is no place for a woman. A woman being a mother is the most honor not as “captain” Proverbs 31 (Sorry not P.C.) P.S. I wish WestJet could tell me a fair lady is at the helm so I can book another flight! Were [sic] short mothers not pilots Westjet. She’s had a lot of backers on Twitter and Facebook and many are putting the man who wrote the note in his place. I wonder if they will find out who wrote it? Challenge for Reddit?